The Detroit Stoker Model RotoStoker VCG is an air-cooled grate designed to provide exceptional efficiency in burning fuels ranging from wood, coal to biomass and is ideally suited for both new and retrofit installations. Moss uses this combustion system in our packaged hybrid, CP and A type boilers and our field erected CD cross drum watertube boiler system. Detroit Stoker is recognized worldwide for its efficiency in generating steam and power from wood and a spectrum of biomass fuels. The horizontal grate design and low setting height make this grate assembly attractive for installation in plants without basements. The grate can be cast from a variety of alloy materials that allows design engineers to fine tune the system for each application based on specific requirements for undergrate air temperature and fuel moisture. The VCG intermittent grate vibration moves the fuel bed forward through the furnace providing automatic ash removal at the forward end of the grate. The grate is driven by an eccentric mechanism that is fully adjustable allowing the system to be optimized for specific operating conditions. Design simplicity and delivery in large shop-assembled modules reduces installation time and expense. The RotoStoker VCG grate has few moving parts and no bearings or shafts in the undergrate area that are to be lubricated. The undergrate area is readily accessible and castings are small making replacement easy, should it ever become necessary. 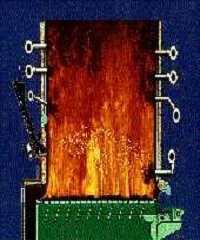 Thorough mixing of the fuel gases and combustion air high in the furnace provides effective staged combustion, which is an important factor in controlling nitrous oxide emissions. Effective air seals between stationary and moving surfaces allow accurate control of excess air.